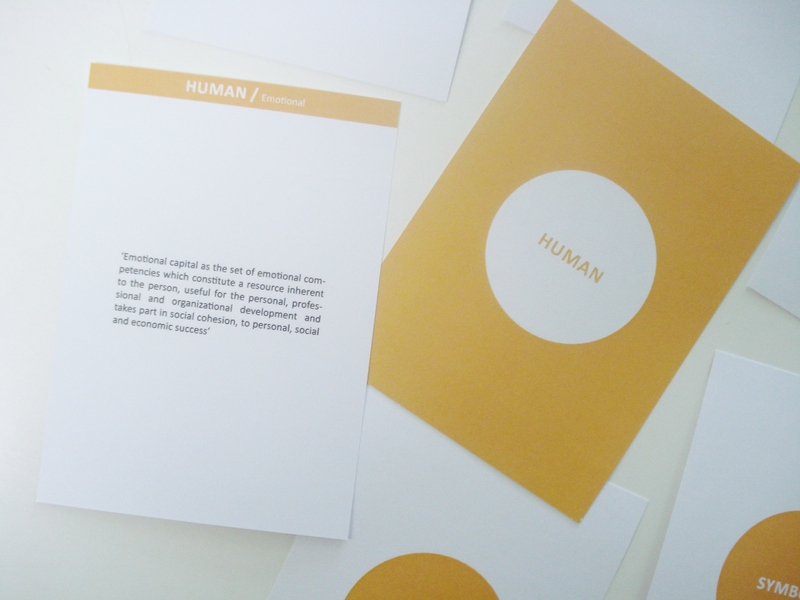 The concept of designCAPITALIA was originally stimulated by Jonathan Porritt’s book Capitalism As If the World Matters and Forum for the Future. 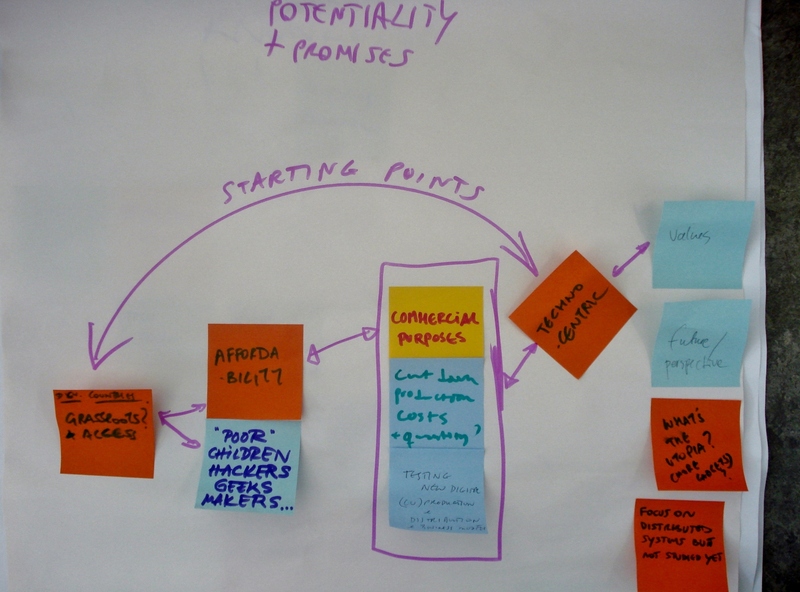 Porritt and FfF developed theFive Capitals Model, which I expanded to ten capitals in my book Design Activism in 2009. 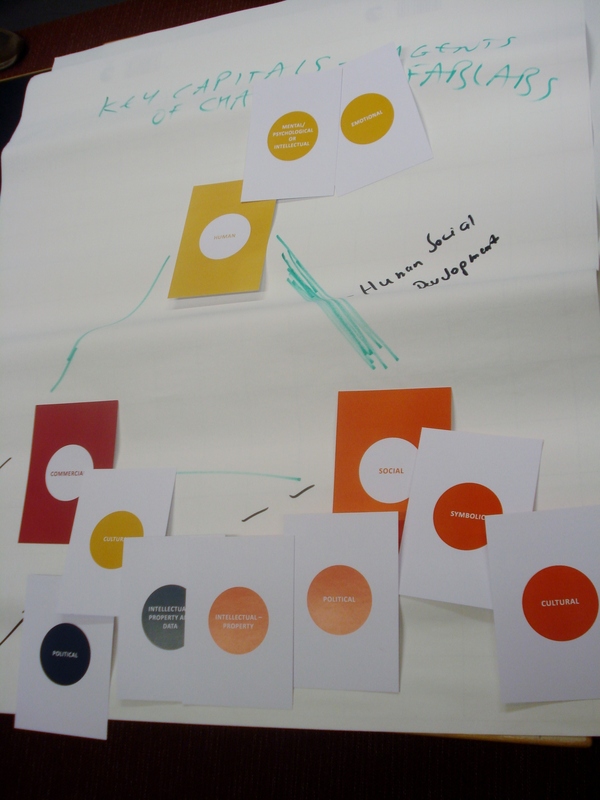 I further evolved my thinking at the Making Futures conference in the UK in September 2011 where I presented a framework with six key capitals and 29 sub capitals. 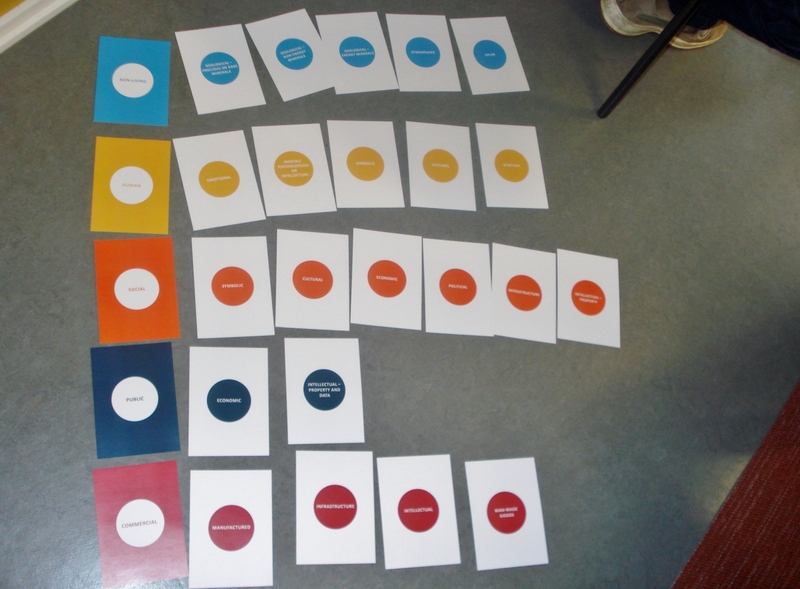 Since then I have developed the concept framework with design researchers  in the Department of Design at Aalto ARTS, culminating in the launch of the Alpha version at the OKF last week. What is designCAPITALIA? 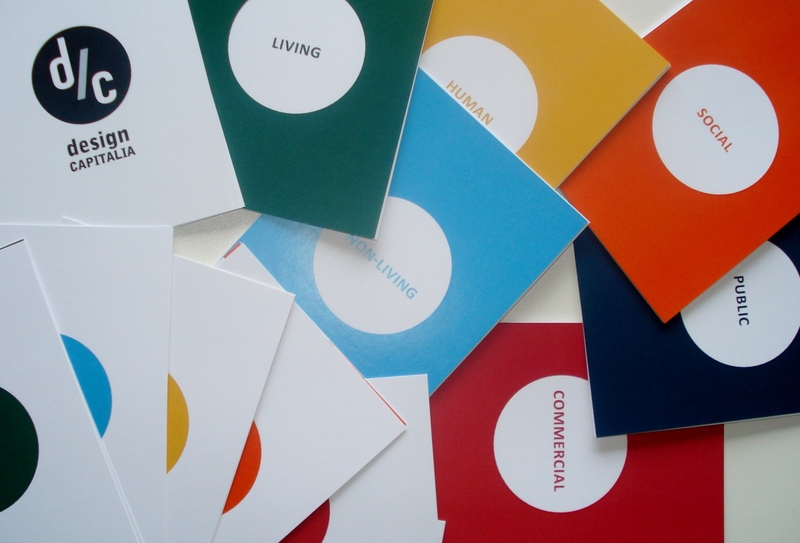 designCAPITALIA is a playful card-based tool for creating a framework to identify and explore diverse capitals in any given (design) context. It enables us to examine any project, organisation, conceptual or actual design, place or locale, set of circumstances, or situation in order to ‘frame’ the capitals involved, examine the relational aspects of the capitals and to create a model of the capitals in a specific context. all or some of which might be relevant to a particular context (Figure 1). Having decided upon the KEY capitals the challenge is to then identify the SUB capitals in each KEY capital group which one feels are relevant to the chosen context. In the Alpha version we have identified 32 sub capitals, but also included blank cards so new capitals can be identified and named. 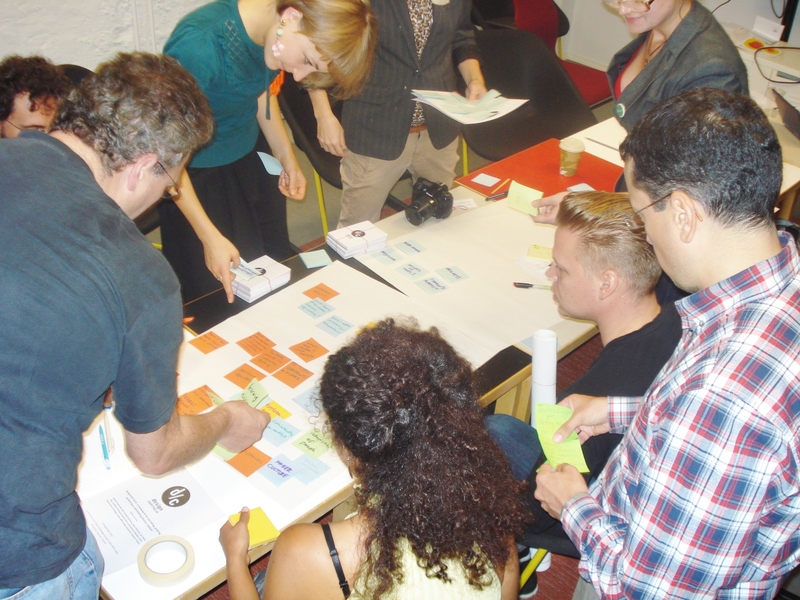 Ten participants joined the workshop in the Open Design topic stream in a room adjacent to the Make auditorium for the OKF in the afternoon of Wednesday 19 September. 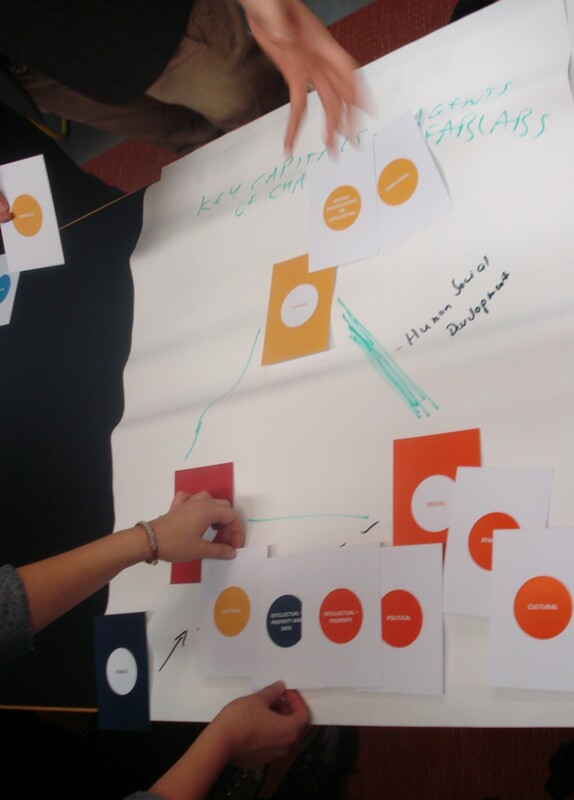 I introduced the background to designCAPITALIA and we then collectively tested a case study as a means to play with the capitals framework (see my workshop presentation here designCapitalia OKF workshop AFL 190912). We chose FabLabs (see also Wikipedia description of FabLabs) as a case study as this seemed to fit the spirit of the Open Design discourse at OKF. 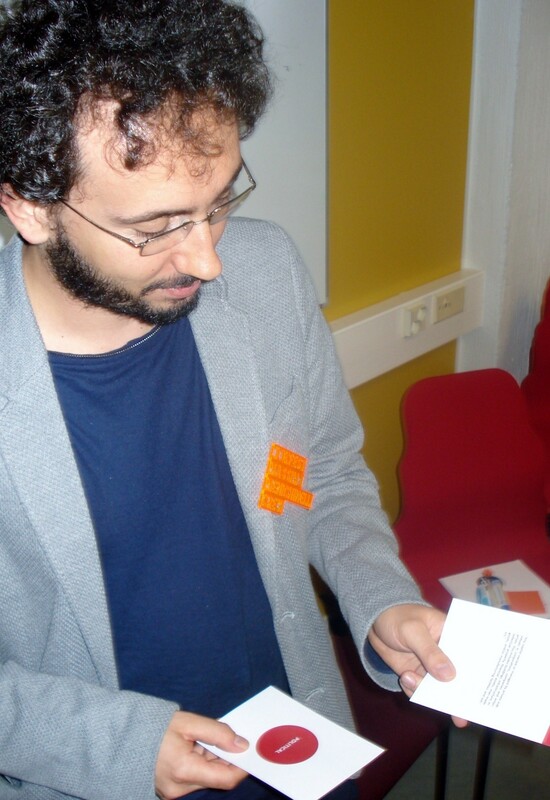 We were lucky to have Massimo Menichinelli, a co-ordinator of the Open Design OKF stream, who is knowledgeable about open design and is a FabLab producer Aalto Media Factory. Step1. Select a context – for example a case study or project, a community (of practice, of interest, of place…), a place (or location/locale). Step 3. Select the Key capitals and Sub capitals that you think are relevant to your chosen context. Lay the cards out on a large sheet of paper. Step 4. Arrange the capitals in relationships which are meaningful to you. How are they related? How are they orientated to each other? Are some more important that others? Step 5. Build a model of the capitals for your context. 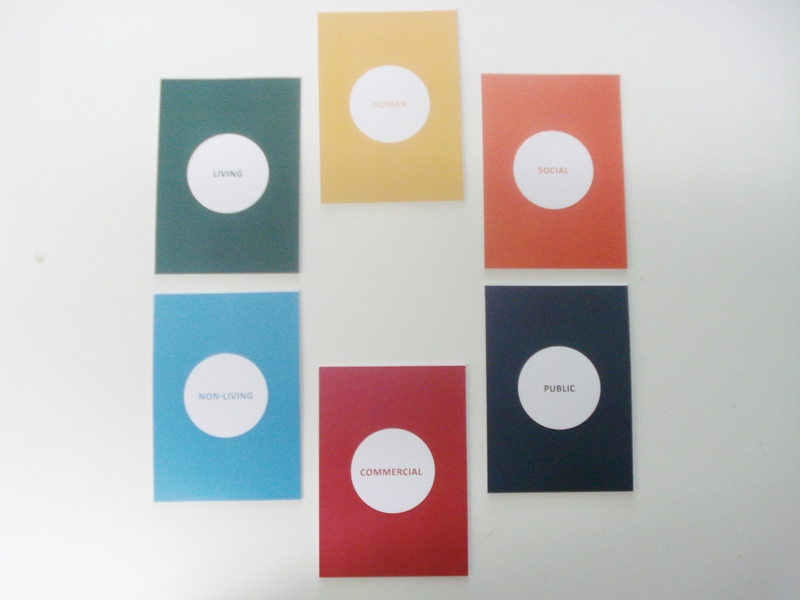 It can be a physical 3D model or you can arrange the cards in a particular way. What do you notice about the relationships between your capitals? Step 5. Now ask yourself ‘Which capitals do I want to grow, to nourish, to protect or conserve and which capitals do I wish to diminish or reduce?’ If you grow one capital, what effect might it have on the other capitals in your model. 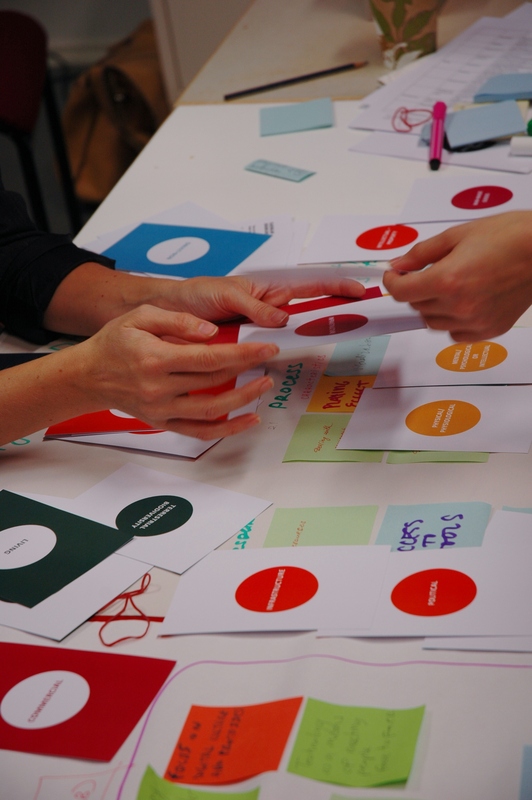 What did designCAPITALIA reveal about FabLabs? 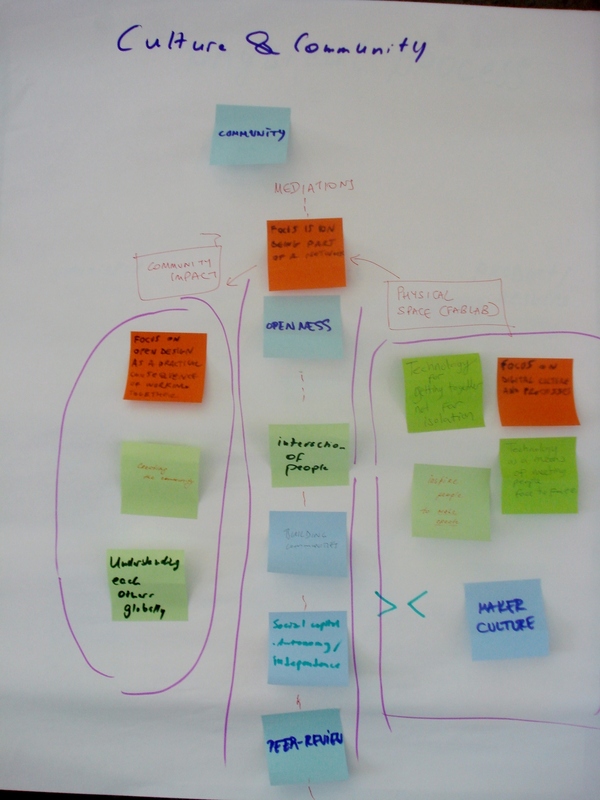 Each team presented their story about each cluster (Figure 5) contributing to the overall contextual mapping of FabLabs. 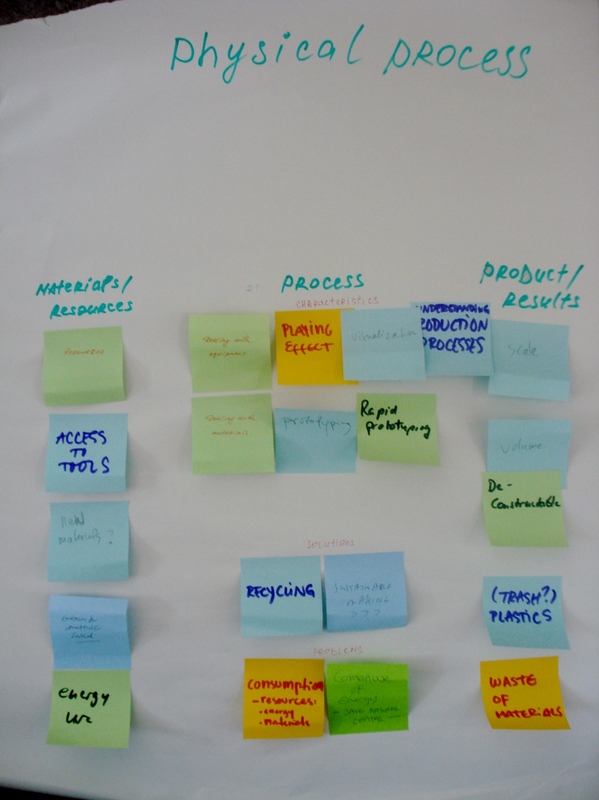 This helped focus on some of the key issues and set some boundaries to the FabLabs context, which enabled us to progress to the Interpretive phase of designCAPITALIA. Working in small teams for each cluster we went through a pack of capitals cards and selected the capitals we felt were most relevant (Figures 6,7,8). In some teams decisions about which capitals were involved seemed fluid and rapid, in other teams deep discussions ensued about the relevance of specific capitals. 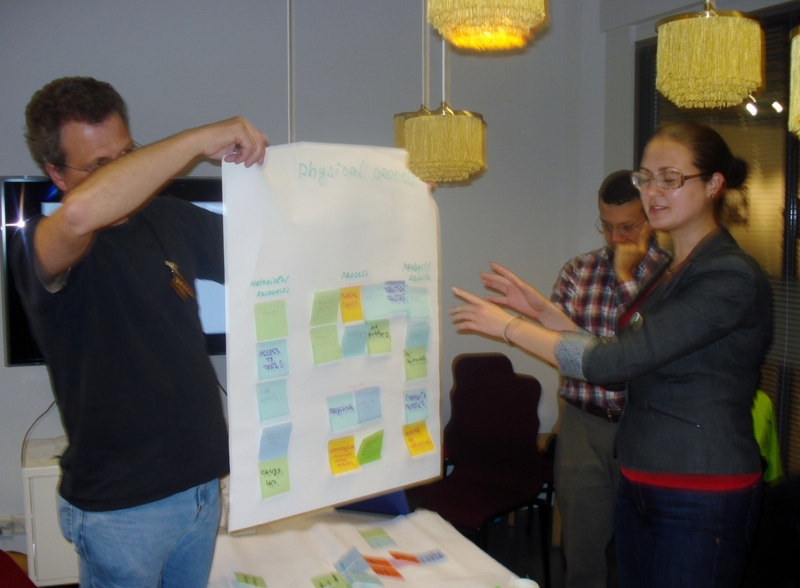 As the workshop facilitator I was conscious of time constraints so I and Massimo kicked off with our capitals selection and then added any capitals that the other teams had found which we had not originally identified. We were quickly able to lay out all the capitals (5 key capitals and 22 sub capitals) that we collectively thought were currently invoked by FabLabs (Figure 9). 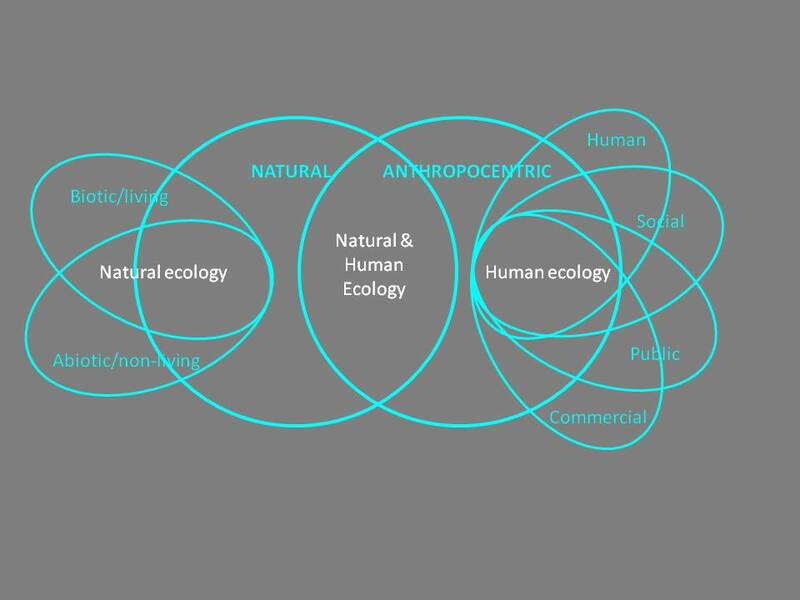 Discussion ensued as to the relationships between these capitals and it emerged that three key capitals were the currently the most important – human capital, social capital and commercial capital (Figure 10). We discussed the relationships between these key capitals and decided that the human-social capital axis was the most important one. Participants then started to move sub-capitals into the model we had created. This encouraged a discussion around the role of commercial capital (in equipment, in IPR of software, in materials and processes) and questions were raised about trying to increase the role of public capital as many FabLabs are situated in universities supported by public funding (Figures 10,11). As the discourse unfolded it was clear that moving the sub-capitals around the model was stimulating a discussion about the current and future purpose of FabLabs and their strategic ambitions. For example, Fab Lab Barcelona was mentioned (later covered by a talk by Tomas Diez at the OKF) where the current focus of electronic and rapid prototyped products was moving into food production, citizens contributing to smart urban information systems and renewable energy. As the designCAPITALIA workshop was proceeding, an open source CNC (Computer Numeric Controlled) milling machine was being co-designed and co-built in the FabLab at Aalto Media Factory. This realisation generated a great conversation about the need to increase public capital involvement to encourage more open source resources and help migrate from existing proprietary to open source equipment platforms. Figure 6. Teams selecting the relevant key and sub capitals. Figure 7. Teams discussing the relevant key and sub capitals. Figure 8. Massimo Menichinelli pondering which capitals relate to FabLabs. We ran out of time to move to a conclusion for the Synthesis phase – which capitals did we want to grow, nourish, protect and/or diminish (?) 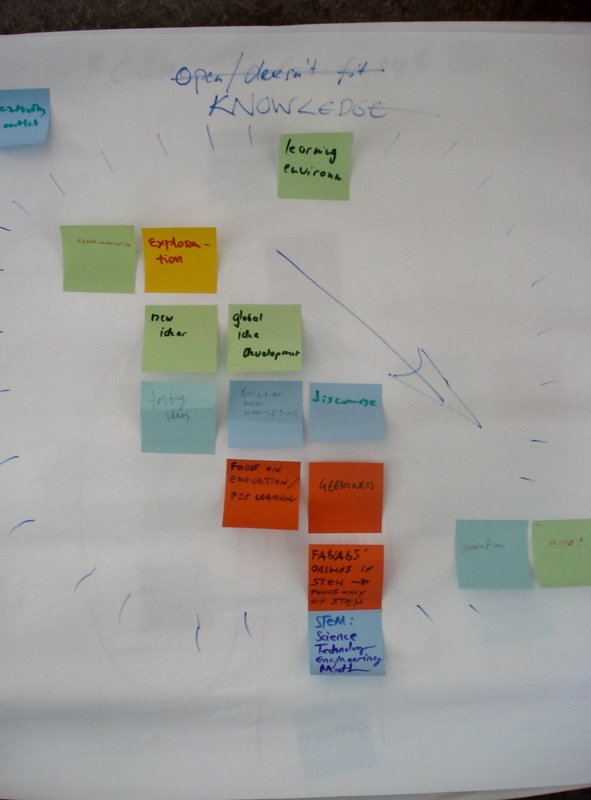 – however it was clear that our workshop discussions based upon the modelling of the capitals associated with FabLabs had generated fascinating ideas about which capitals we might be interested in focusing upon. 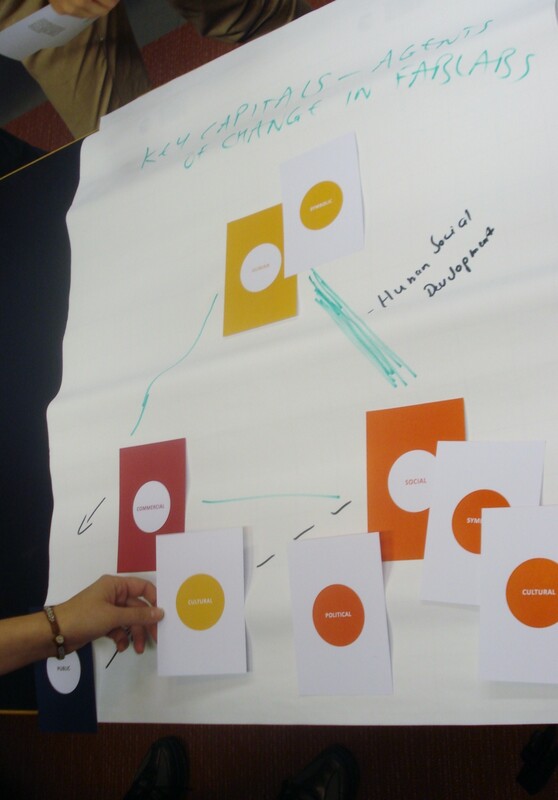 The workshop demonstrated to the designCAPITALIA authors that the Alpha version offers an interesting tool to challenge our perceptions and interrogate our purpose(s) around a specific context. Over the next few weeks we intend to launch a dedicated web site for designCAPITALIA where those who experiment with the tool can show how they applied, modified and developed it. We believe making designCAPITALIA open source provides it with the best potential to grow and become a relevant tool for all those making critical decisions about how their (design) work impacts on diverse capitals. 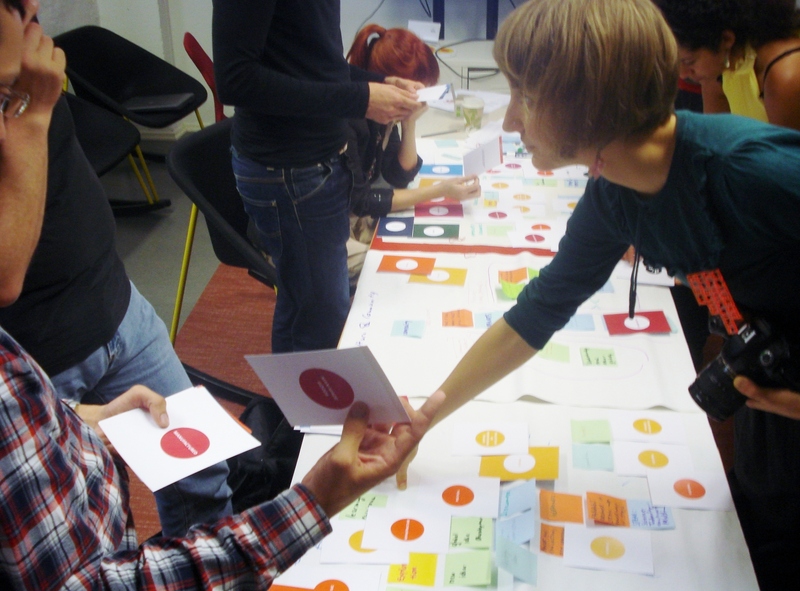 How can you get designCAPITALIA to play with? A full description of the evolution of designCAPITALIA, how to apply the framework and how to play and model with the selected capitals is downloadable here Design_Capitalia_leaflet_for_OKF_FINAL AFL 190912 v2 and the set of cards (Figure 2) for printing in duplex is here Design Capitalia Cards_print A4_def Alpha version 190912 . designCAPITALIA is made available in the Alpha version under a Creative Commons Attribution-NonCommercial-Share Alike 3.0 Unported licence Alastair Fuad-Luke with Claudia Garduno, Alaca Farettin, Jari-Pekka Kola, Svetlana Usenyuk, Sandra Vina and Katharina Moebus, 2012.
 designCAPITALIA is an original concept by Alastair Fuad-Luke developed with Claudia Garduno, Alaca Farettin, Jari-Pekka Kola, Svetlana Usenyuk, Sandra Vina and Katharina Moebus, 2012. Photos by Alastair Fuad-Luke and Katharina Moebus.